Uplifting Athletes is proud to announce that the Western Michigan and Syracuse football programs have joined forces for their upcoming 2018 season opener to shine a spotlight on the Rare Disease Community. 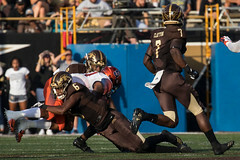 The chapter leaders from each school, with the support of both universities, worked together to make the match-up between the Broncos and Orange on Friday, August 31 at Waldo Stadium an Uplifting Athletes Rare Disease Awareness Game. Players from each team will wear Uplifting Athletes stickers on their helmets to support Uplifting Athletes and the Rare Disease Community. During the third time-out in the first quarter, rare disease patients will be the honored on the field in recognition of the two programs coming together to support one cause. 14-year old rare disease patient Chloe Hunt from Alagille Syndrome Alliance, along with her mother and twin sister, will join the teams on the field. The Western Michigan chapter leaders were inspired by Syracuse Chapter President and offensive lineman Sam Heckel’s rare disease journey and the courage shown by Orange quarterback Sam Culpepper during his recent cancer battle. 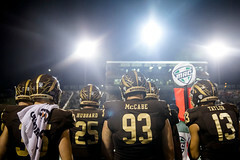 Thank you to the athletic departments at Western Michigan and Syracuse for supporting the football student-athlete leaders of each chapter by allowing them to recognize the Rare Disease Community as part of this game. This entry was posted in Rare Disease Awareness, Uplifting Athletes, Uplifting Experiences. Bookmark the permalink.